Various media accuse Chinese companies of making rice by mixing potatoes with a synthetic resin. This “rice” is cheap but highly profitable. However, the resin is hard to digest and is like eating plastic. Food safety scandals have rocked the country on several occasions. Beijing (AsiaNews/Agencies) – China is accused of making rice with “plastic”. The country has a long poor food safety record, including poisoning and death. The Weekly Hong Kong reported that fake rice was sold in the Chinese town of Taiyuan, in Shaanxi province, made by mixing potatoes, sweet potatoes and industrial synthetic resins. Although the rice reportedly stays hard even after cooking and is hard to digest, production costs are very low and profits very high. A Chinese Restaurant Association official said that eating three bowls of this fake rice would be like eating one plastic bag. An investigation is apparently underway into the affair. China has a very poor food safety record. The worst case involved milk baby formula made with melamine, a plastic compound bad for human health. Six infants died from drinking the milk, whilst more than 300,000 suffered kidney problems, some very severe. The scandal broke out in September 2008; however, the authorities had known about it for months but kept silent to avoid bad publicity that might affect the 2008 Beijing Olympics. 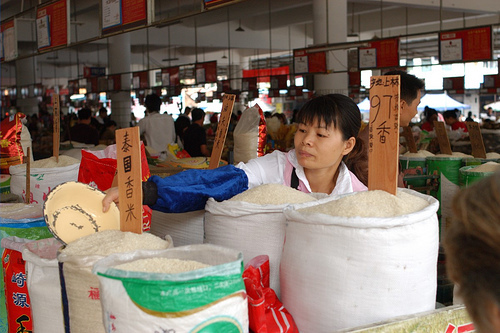 In July 2010, the Global Times reported that a company in Xi'an, Shaanxi, was involved in a simpler kind of fraud by adding flavouring to ordinary rice and selling it as the more expensive ‘Wuchang rice’ brand. Chinese authorities have repeatedly sentenced dishonest business people to long prison terms, but have proven unable to guarantee food safety.